Give yourself a Natural Facelift Using Acupressure Therapy! Interested in a relaxing, natural way to look younger? Would you like to lift the cheeks and jowl areas of your face? Not ready to go under the knife? There are natural, facial massage techniques that you can do to keep your skin looking healthy and youthful. By giving yourself an acupressure natural facelift massage, you can fend off unwanted wrinkles and tone sagging facial muscles. Acupressure is an alternative medicinal treatment. Pressure is applied to the different “meridians” in the body to alleviate specific ailments. It's thought that by putting pressure on specific points within the body’s meridians, health will be restored. An acupressure massage uses these specified points, applying pressure to the areas while rubbing in circular motions. Don’t get acupressure confused with acupuncture; while they have the same philosophies and use the same pressure points, acupressure does not use needles as acupuncture does. How do I use acupressure for a facelift? Set aside some time for yourself to start your facelift either in the morning or the evening—these are the best times to do the massage, but not if you have just eaten or you are feeling tired. Go through daily or nightly beauty routine and then begin. When you first start, plan for about twenty minutes or so, but if you are consistent, you will start to understand the process, and you will be able to complete the facial massage in less time. There are four ways you can apply pressure to this facial massage: with your thumb, with your index finger, with your knuckle, or with a blunt, smooth object. Use medium pressure in clockwise motions on each point. Start with the left side and then the right. Stimulate each point for about ten seconds then move to the next adjacent location (i.e., point one and then point two). Where are the meridian points? Each area of the face has specific points to stimulate. For this facial massage, there are 29 points across the face and neck. For the full facelift acupressure massage, start with point number one and move through location 29. To begin, we start at the top left of the forehead and move across and down as we go. What do some of these points mean? Together, all the points help fight aging through stimulation. They reduce the look of wrinkles and tone the face for younger-looking skin. Some areas have more accurate powers. 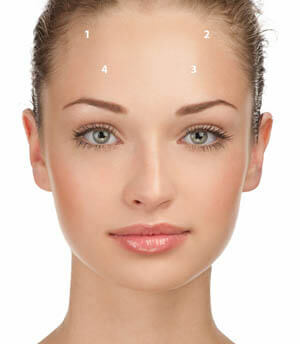 Points 1, 2, 3 & 4: These points help soften lines on the forehead. They also can help relieve headaches. Points 5, 6, 7, 8, 9 & 10: Reduces the look of lines around the eyes. Points 9 & 10: Help alleviate allergies, relieve inflammation in the sinuses, and reduce pain in the lower back and neck. Point 29: Helps control sneezing. If you remain consistent and do your acupressure massage daily, you will likely see noticeable results in the way your skin looks and feels. This natural aid to aging skin may be what you need in your skincare routine. For those of you who love the thought of doing a daily massage, but really don't have the time to devote, try our LED Light Therapy with Microcurrent. The Microcurrent with titanium plates gives you the ultimate lift and retrains your facial muscles. At Skin Perfection, we offer a full line of anti-aging skincare products to keep you looking young!